Did you know doctors had access to an x-ray machine, but didn’t use it and therefore couldn’t locate the assassin’s bullet in William McKinley? After President William McKinley was the victim of assassin Leon Czolgosz’s two bullets on September 6, 1901, at the Pan-American Exposition in Buffalo, New York, he was rushed to the hospital at the Exposition at 4:25 p.m. This was not a top tier hospital and there was no qualified doctor even on site. The best surgeon in the city of Buffalo was in Niagara Falls. Dr. Herman Mynter was the first doctor on the scene. Another surgeon, Dr. Matthew Mann, also arrived, but Mann was a gynecologist. After giving McKinley morphine and ether, they began abdominal surgery, but they lacked even basic instruments such as retractors. Mann found damage in the stomach, but could not locate the bullet itself, and said that it was likely it would do no more damage. There was a primitive x-ray machine at the Exposition, but no one used it. When finally Dr. Roswell Park, who had been in Niagara Falls, arrived, he did not want to interfere. McKinley appeared to be recovering, while in fact he was getting worse. On September 13, he collapsed and word was sent to vice president Theodore Roosevelt to be prepared to take over. McKinley barely made it through the evening of the 13th, and died at 2:15 on the morning of September 14. One of the bullets was not found even in the autopsy, but the other had entered McKinley’s colon. 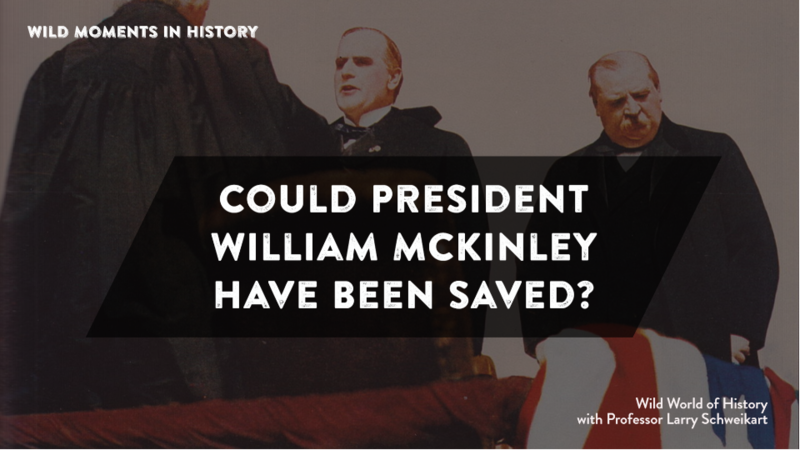 Following McKinley’s assassination, more protection to U.S. presidents was assigned. Over time, especially after John Kennedy’s assassination, a doctor would travel with the President, but even then, as demonstrated in both the killing of JFK and the serious wounding of Ronald Reagan, neither protection nor medical attention could entirely protect a president. For further reading, see Larry Schweikart, The Politically Incorrect Guide to the Presidents, Part 1: from George Washington to William Howard Taft.